Epping Forest is using Smore newsletters to spread the word online. Welcome to this weeks issue of ENGAGE. Since 6 June 2014 where we published the first issue of Engage there has been 3223 total views (+299 this week). Our weekly staff newsletter is for sure popular. Thank you for your support. Keep talking. 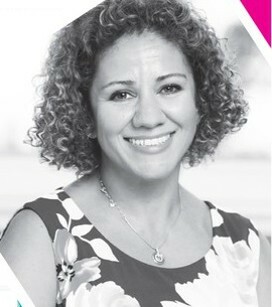 If you have an article for ENGAGE please send it to Laura Le Maitre LauraL@gcfe.net by Wednesday at 12.00 midday. Thanks to those of you that attended the all island pensions briefing on Monday Evening at Beau Sejour and also the follow up session on Thursday at Les Ozouets – over the coming weeks individual unions will be consulting / balloting their members on the current proposals. 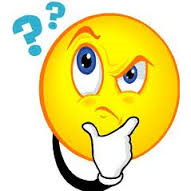 Should you have any pension specific questions or need clarification of the proposals then please feel free to contact Chris Torode. PRO-MONITOR PRO-SOLUTION USER FEEDBACK WANTED! Please follow this questionnaire to leave your valuable feedback. In this section you will read about the life across the 3 main sites of the college. Saboohi will share with you the thoughts and events of the week in this section. 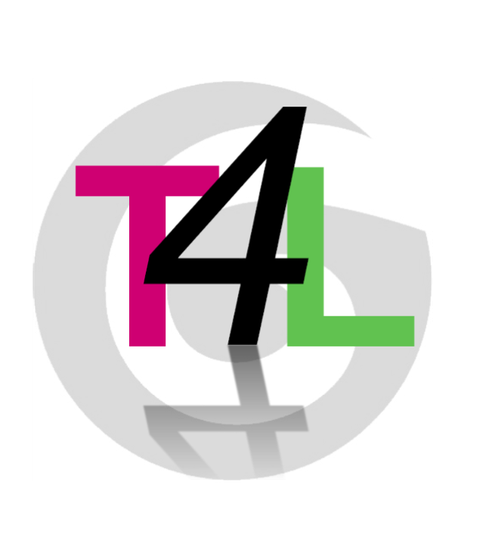 Adam Blackwood- Lecturer, Educationalist and eLearning specialist addressing T4L staff INSET day. An EVENT-FULL week! Truly inspired. What a superb week this one was. 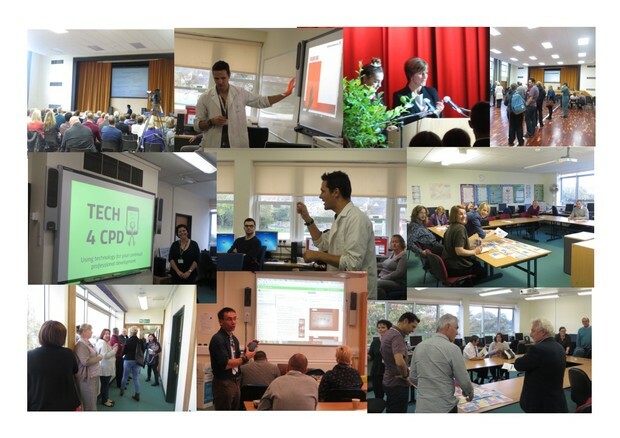 The buzz of the Today, Tomorrow, Together (AKA-TTT) event was magnified by the very engaging and well organised Technology 4 Learning INSET day event were the art of possibilities was showcased to perfection by colleagues in various workshops and discussion. Adam Blackwood from JISC South East added a bit of brain juice to the mix and got us all thinking about our practice and how incorporating some simple tools can make a massive difference in outcome for learners. Some of us are still amazed as to how on earth he managed to hide so many gadgets in his pockets. I guess he will still be pulling things out of his pocket as he clears security at the airport on his way back to the UK! We also had the extremely popular Early Years Conference, what an excellent turn out and superbly presented event that was. Then the icing on the cake for me was listening to Kim Abbott and her journey in life at St Sampson High School's Year 11 Work Experience Achievement Evening. So all in all a truly inspiring week. Full of buzzing events! Well done to all of you for the energy, dedication and commitment you show to your profession. We have had much positive feedback from all of the events above. Much of which makes us realise the importance of moving from words to action. 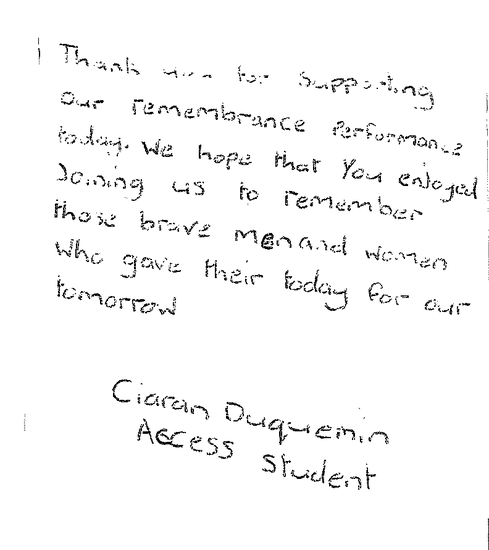 For me the highlight of the week was the performance of the Access students at PRCPA for remembrance day. Staff were superb and their hard work was reflected in the outstanding poignant performance by our students. It was a very proud day. One that will make the tough days we all may experience in our jobs very worthwhile. A big thank you and a massive congratulations to all staff and students. The Education Vision document, “Today’s learners, Tomorrow’s world” provides rich ideas and inspiration for what might be realised on our island through the power of education. This document clearly points the way to progress. But what good is inspiration without application? What good are principles if they are not converted into practice? This College aims to close any such gap. This week has seen some incredible community events that have really showcased the work that we do at the College. Tristan and the Access team brought together an incredible performance on Monday to commemorate Remembrance. For anyone that was privileged enough to attend it was a very proud moment to watch the students deliver such an emotional and poignant performance. 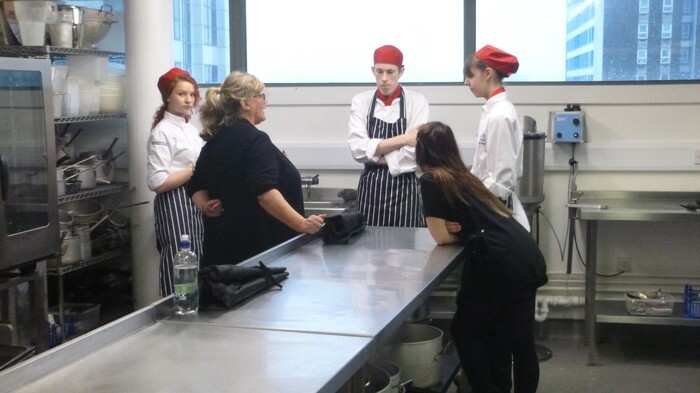 Bringing together students from the Access area and also pupils from Le Murier highlighted the excellent transition programme that Sue and the team have in place and the look of pride that was so evident on the students faces was very rewarding to see. THE FISH MARKET SERIES inspired by the carved lines found in the granite floor of the old 19th century Fish Market in St Peter Port, Eric has produced a new series of work on paper. Always interested in that interface between materials, process and concept Eric over the last year has been placing large pieces of paper on the granite slabs. Then saturating the paper with water, tinted only by a natural ‘watercolour’ pigment, he starts to walk on the paper in-situ. In this work Eric talks about looking to capture those faint, almost forgotten traces of the original building and the more he walks on the paper the more imbedded the pattern becomes. “I like how one can interpret the images in so many different ways. On one hand they can be read as isobars or tidelines, on the other, as fish bones, magnified fingerprints or abstract waveforms. In all these interpretations there are references to identity and the islands maritime heritage; and I am convinced that these associations are not accidental”. 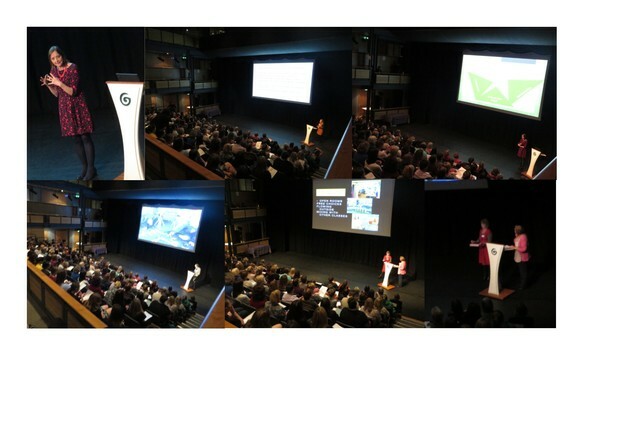 Kim, Fiona and the H&EY team delivered an outstanding Conference on Tuesday. The event brought practitioners from across the sector together to engage in workshops and listen to the guest speakers that were inspirational and forward thinking. The PRCPA was almost at capacity and the student worked very hard to support the workshop sessions. Penny Tassoni delivered the keynote speech and the feedback from the evening has been overwhelmingly positive. 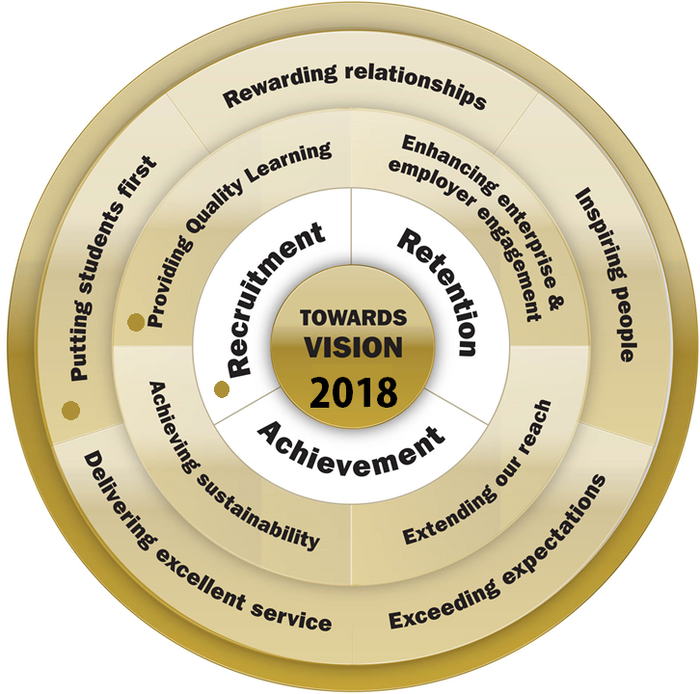 Future years will see this grow into a significant event in the calendar for the sector so congratulations to the team for all of their hard work in bringing it together. Level 3 second year Engineering students went with tutor Paul Davies to Offshore Electronics this week to have a look at their project management and planning. They met with the Managing Director, Steve Marshall who showed them around. The students were really interested in the surface mount technology coupled with traditional methods of component building. They met with past students now working there. The session finished with a Q & A session with Steve, who, when looking for Mechanical Engineers in the future will be looking at Students from GCFE to help him with that. Julie, Steve & Paul from the Hospitality & Catering Dept. 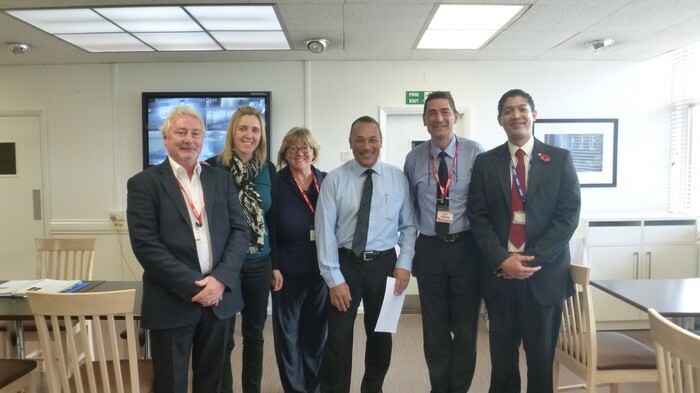 this week visited the Isle of Wight College and also Highbury College in Portsmouth where they were given a very warm welcome by Mr Robert Strachan and the staff in the hospitality and Catering team, who provided an extensive tour of the department. They had heard that the catering section had an excellent reputation, and were impressed by the experience, passion and motivation in all the staff they met on the visit. The team left feeling positive and motivated to bring that enthusiasm back to the island with them. I am delighted that the College has received funding, and has now ordered a new Mortar Mill to replace the present one which is over 50 years old! In addition, great news that it is very likely the Department will fund more new equipment for the Workshops from the Capital Expenditure. 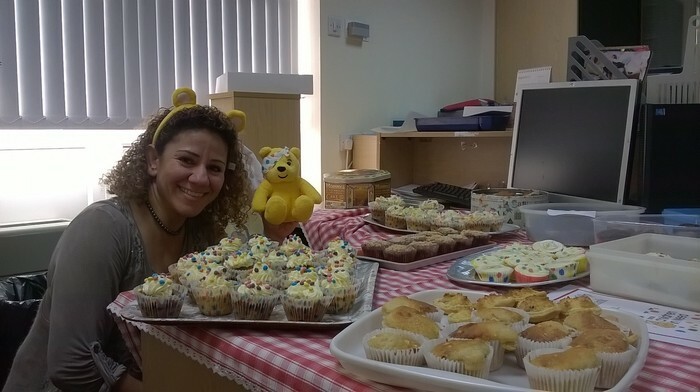 Pudsey has a new helper! Jennette & Aimee - the Cake Ladies! 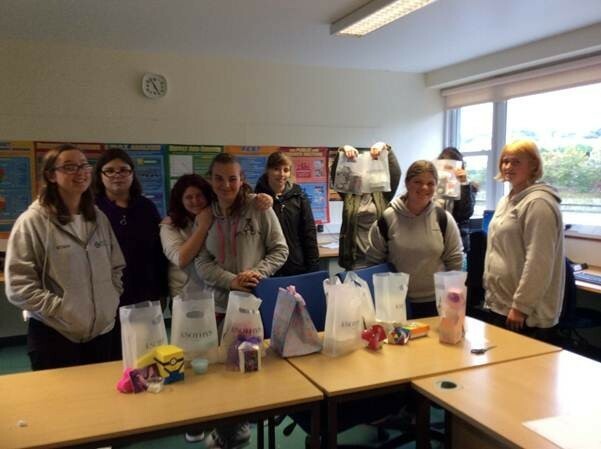 The Foundation Care students had a fun time this week making their own beauty products. 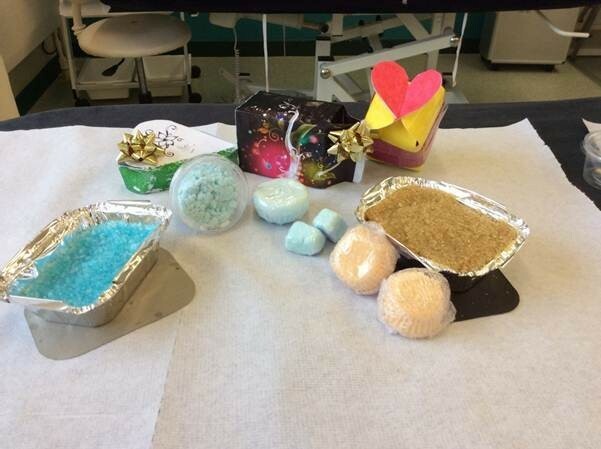 They had to design a gift box for someone special and then make a salt scrub, a sugar scrub and bath bombs and fizzes, all expertly guided by Ali, the students were fully engaged in this endeavour and produced fabulous results – see photos below. Meanwhile the Level 3 Hair dressing apprentices received training this week in Creative Colour. Nicolle Bullen from Wella came to the island on Monday to deliver the course which Jane and Claire also attended - keeping up their CPD. 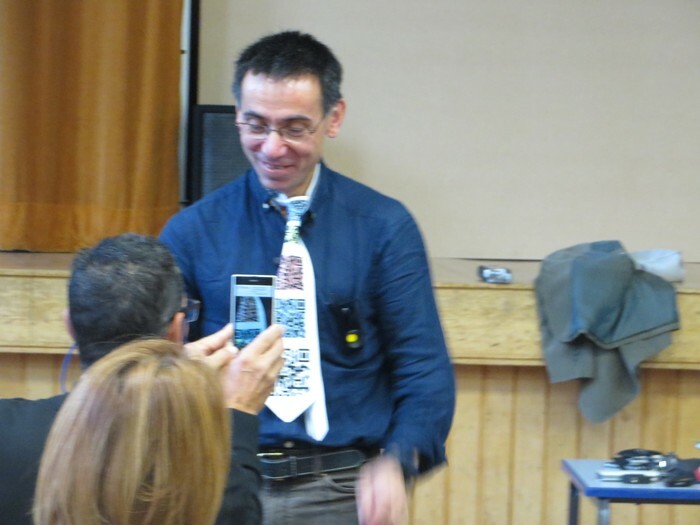 The highlight for LOC this week was our INSET day focusing on Technology 4 Learning. Adam Blackwood from JISC opened the day with a review of so many ideas on how to use technology in the classroom. Various workshops were run by the Technology 4 Learning Taskforce – Alice, Charlie, Dan, Martine, Nicola & Rachel - on practical tools, tips and tricks on using technology to enhance the learning experience. I would like to thank all the people involved in yesterday’s event – the Taskforce, Craig and his team for putting on a lovely lunch and to the caretaking teams and technicians for their set up/take down of the hall. And thanks to all attendees who participated in the event and contributed in a very positive way. We will be putting resources from the day onto MyCFE over the next few days; and we will plan further events and training to continue the momentum – watch this space. 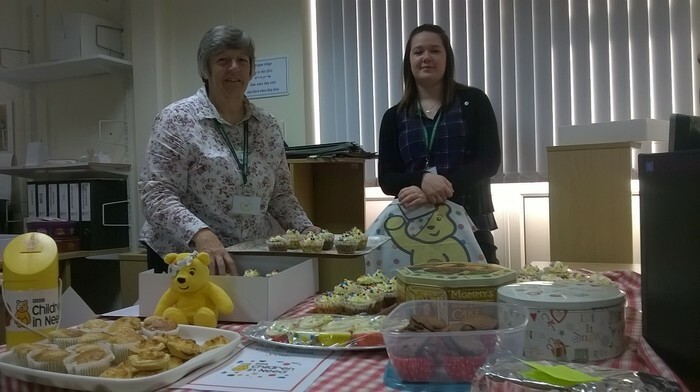 All the girls (Monica, Caroline, Laura, Jennette, Rachel G, Steph) and Ian's wife for being this week's "STAR BAKERS" for the Children in Need Cake Sale. 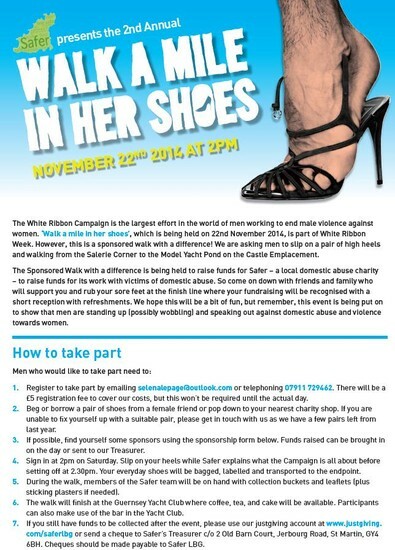 Total raised will be announced in next Engage next week. Thanks to all who took part by buying and eating! Thank you for organising Thursday evening's workshop and for seeing me today. I feel that there is real hope for an exciting future for the College after having spoken with you today. I also felt re-energised with enthusiasm once again. I work for an outsource provider as an HR Business Partner. Some of my clients prefer their staff to undertake the lesson time for professional qualifications, such as ICSA and ACCA, either in the evenings or at weekends. I would be happy to discuss this with you further. 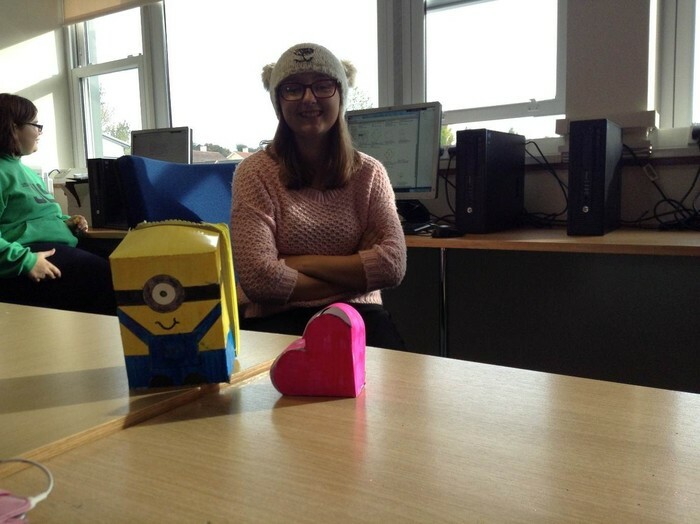 Thank you to Aimee for typing up all the Lesson Observation sheets - you are doing a great job! Rod Tostevin, always on hand with tech help and makes great DVDs! thank you Anne-Marie for all your help with admin for the Childcare Conference. Thanks to all staff who helped with H & E Y Conference. We had help from all campuses – great! Thank you to Year 1 and Year 2 Childcare students for their help at the conference. Very professional attitudes. Well Done! The college uses a standard Education focussed filtering system that is required in our environment that has a duty of care for our 14-18 population. The filtering system has a baseline defined and approved for Education and lecturers and students can request an unblock at any time. In the event of a site not being unblocked staff are more than welcome to escalate their request for proper consideration by senior management. Wherever possible we monitor and action all unblock requests as quickly as possible. We have seen some instances of Microsoft Office Activation issues (Not Windows) and where they have been reported to the helpdesk they have been resolved promptly. We are taking steps to permanently eradicate this problem which has been caused by excessive activations against a now expired key. 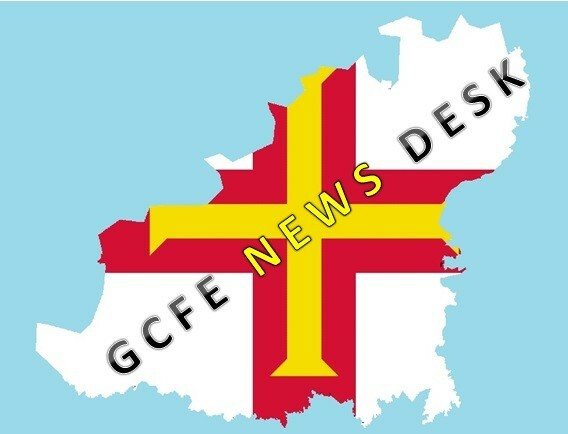 The correct place to flag this up would be on the support helpdesk at http://helpdesk.gcfe.net where it will be dealt with as quickly as possible. ‘I would like to take this opportunity to thank my colleagues in the Access department, and also staff from across the college for their support at the ‘Never Forget Performance’. The show was a huge success, and this was due to all of the hard work by everyone involved, and also to the audience members who were available to join us on that special day of remembrance’. Although this is the College Open Evening we felt it would be appropriate to hold our Pamper Evening alongside the event, to demonstrate a realistic working environment and add to the positive atmosphere. Please feel free to join us if you are able to. Tickets are available through the Beauty Reception. Need Admin help and support? This is the third conference of its kind and will provide local coaches, athletes and their parents with an even wider range of workshops than offered previously with an increased level of expertise. The conference is open to anybody with an interest in young people, sport, performance, learning and improvement in any sphere of life. On Friday evening at St. Sampson’s High School a series of keynote speeches will kickstart the weekend and will be headlined by Professor Vincent Walsh of University College London. Over Saturday and Sunday a team of specialists from the world of professional and international sport will join local speakers to provide a wide range of impactful workshops. EXAM DROP-IN'S - ANY QUERIES? COME & SEE US! 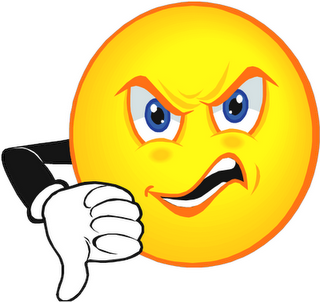 We are disappointed that there has been a lack of support in the exam drop in sessions at Les Ozouets & Delancey. Hopefully this is because you are all confident. There are a few sessions left this year so please if you have any queries then make the effort to come to the remaining drop-ins. Please find below the dates, times and room locations for our Exam Drop In’s. These sessions are being held for any Exam related issues and Pro Solution guidance that Tutors may require. We ask that all staff that have questions and problems that need solving to come to one or more of these drop in’s where we will be happy to help. We look forward to seeing you.